Sending light in a staright line is easy. Getting it around corners -with out losing intensity, is a different story. Even when a light beam reflects from a good silvered mirror, not all of the incident light bounces off; some is absorbed by metal, as much as 20%. 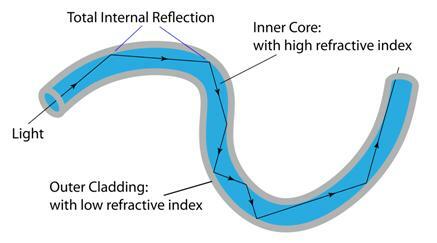 A sequence of reflections, in which 20% is lost at each bounce, will quickly reduce a powerful beam to a faint trace of its former itself. A light pipe is made of glass, designed in such a fashion that there is no refraction of Light out of glass, and hence, there is no loss of intensity. The Glass just "pipes" the light up and around the curve. In commercial use, light pipes are drawn out as very long, fine fibers of glass. The diameter is about 0.1mm and field of applications itself is called fiber optics.